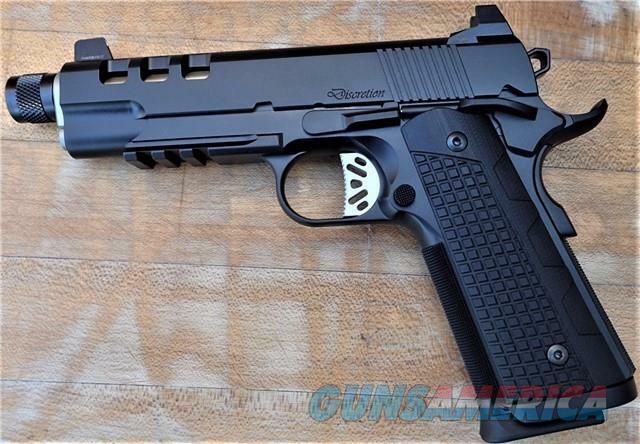 *Dan Wesson Discretion Commander Size 1911 • Hand-fit 70-series frame and slide /• Forged slides and barrels /• Hand-fit match barrels /• Billet alloy steel fire-control system /• Zero MIM parts /• All premium components /• Lowered and flared ejection port /• Beveled magazine well /• Carry bevel treatment /• Undercut trigger guards /• Hand-polished flats / • Crisp 4-lb. trigger job out of the box /• Two magazines /• Signature-series case /• Barrel bushing wrench. Experience one of the finest most accurate out-of-the-box 1911's ever made with this Dan Wesson Discretion Commander brought to you by CZ USA! The Discretion Commander gives you a match grade extended barrel that's suppressor ready. Its serrated trigger, competition styled hammer and tactical Tritium night sights are ready to take on any competition. With an aggressively ported slide, G10 grips and a gorgeous durable Black Duty Finish. Bring home the Discretion Commander and see how Dan Wesson has earned its reputation as one of the most sought after premier firearms manufacturers in the world! With suppressors becoming more and more mainstream, the Discretion’s match-grade stainless barrel is extended and threaded to make it a ready host. Its aggressively-ported slide, serrated trigger and competition-inspired hammer give it a look all of its own, making it stand out in our line of 1911s. High tritium sights allow for sighting over the top of most pistol suppressors, with a rear designed so that the slide can be racked on a belt if using the pistol one-handed. The Discretion finish is our super durable black Duty finish. This finish is a revolutionary treatment process that actually bonds to the components and creates a super-durable matte black skin. Our Duty Black finish beats any of the spray-and-bake finishes most companies use today, hands down. Our durability testing proves it and our customers love it – which is proof enough for us! BUYERS USING "EZ PAY" We figure "EZ PAY" by dividing the cost of the firearm, shipping and the 3.5% credit card fee into monthly payments and rounding up. Our financing is subject to these terms and not upon mathematical errors or omissions in our ads. * Firearms ship after payment in full. *"EZ PAY" is for Credit Cards or Debit Cards. * We will send you a secured link to make all your payments. *With our secured link, you enter your own credit card information, we do not have access to your credit card numbers. *Using the payment link, additional payments of any amount can be paid at any time. *You may pay in full at any time without penalty. *You will be e-mailed a receipt from our bank within a few minutes of making your payment. IMPORTANT WARNING *Payments are due every 30 days from the auction closing. *If a payment is more than 30 days late, the firearm will be re-listed, and you will lose all payments made. *Payments are non-refundable. BUYERS NOT USING "EZ PAY" Our auctions are based on cash sales. If you would like to use a credit card, there is a 3.5% credit card fee. IMPORTANT: We do not take credit card information over the phone. We will provide you with a secured check-out link to make your payment.